The Judge Dredd & The Worlds of 2000 AD Quick-Start is an introduction to the Judge Dredd & The Worlds of 2000 AD Roleplaying Game currently being funded on Kickstarter. Published by EN Publishing, it includes a simple explanation of the mechanics, four pre-generated Judge player characters, and a complete scenario which can be played through in a session or two. The setting for this quick-start and the Judge Dredd & The Worlds of 2000 AD Roleplaying Game is the future depicted in the stories starring Judge Dredd in the long running British weekly comic, 2000 AD. This is a post-apocalyptic dystopian future in which the populations of the world are crammed into mega-cities where unemployment and crime are rife, such that the home city of Judge Dredd, Mega-City One, is governed by the Justice Department and its lawmen, the Judges, are charged with the conviction, sentencing, and possible execution of criminals. In Judge Dredd & The Worlds of 2000 AD Quick-Start, the players will roleplay Judges—the Judge Dredd & The Worlds of 2000 AD Roleplaying Game provides rules for playing Judges, Perps (criminals), or citizens as well as for playing in the other settings explored in 2000 AD. A character in the Judge Dredd & The Worlds of 2000 AD Roleplaying Game is defined by ten attributes: Strength, Agility, Endurance, Intuition, Logic, Willpower, Charisma, Luck, Reputation, and Psionics. Each has a basic attribute score and a derived value which indicates how many dice are rolled when a character wants to take an action. In the Judge Dredd & The Worlds of 2000 AD Quick-Start the basic attribute score is not used and in the four pre-generated Judges provided, the derived values are typically two or three. In addition, skills such as dodging, law, medicine, perception, and so on, provide a character with further dice, usually one or two for the given pre-generated Judges. In addition, Judges—and other characters—also have Exploits, the equivalent of advantages. For example, ‘Voice of the Law’ enables a character to make an attack against the Mental Defence of those within hearing distance and if successful, give them one command, whilst ‘Achilles Heel’ allows a character to analyse target and ignore its Soak value, but only once per target. This bonus can also be granted to an ally. The four pre-generated Judges each have two or three such Exploits. Oddly, none of these Exploits are listed on the pre-generated Judges’ character sheets, so the players or Game Master will need to note them down on the back of each sheet. The mechanic in the Judge Dredd & The Worlds of 2000 AD Roleplaying Game uses a dice pool assembled from six-sided dice, the number a combination of a character’s derived attribute value, skill value, and equipment. Essentially, a player rolls the dice pool and attempts to beat a target number, including Routine (ten), Challenging (fifteen), and Difficult (twenty). Characters also have Defences—Melee, Mental, Ranged, and Vital—which act as target numbers when they are attacked. Judges have a uniform and helmet which provides a Soak value against any damage they might suffer. The four pre-generated Judges include a Psi-Judge, a Med Judge, a Street Judge, and a Tek Judge. Each character sheet also lists all of the equipment a Judge will need when on foot—Lawgiver (pistol) and its various types of ammunition, Daystick, Bootknife, Judge Uniform and helmet, Handcuffs, and Birdie Lie Detector. Also on the character sheets are minor nods to the characters’ personalities and history. The scenario is called ‘State of the Empire’. In what is a pleasing touch, it takes mere days after the events of the very first Judge Dredd story which appeared in the second issue of 2000 AD. In that, a Perp known as ‘Whitey’, hiding out in the derelict Empire State Building, kills Judge Alvin and in response, Judge Dredd volunteers to go in and apprehend him. In ‘State of the Empire’, the player characters, all rookie Judges are tasked with clearing the lower four floors of Perps, gangs, and vagrants. It is possible to obtain some further information, but very quickly the Judges are sent out to conduct their assignment. Overall, this set-up is a nice nod to the history of the Judge Dredd comic strip. Unfortunately, ‘State of the Empire’ is at best adequate, at worst, uninspiring. The problem is threefold. First, every other scenario written for the previous versions of a Judge Dredd roleplaying game has taken its cue from the comic book and included a streak of dark satirical comedy to its storyline, accompanied by puns and wordplay. There is none of that present in ‘State of the Empire’, meaning that it is quite literally, witless. Second, given that the characters are law enforcement officers and there are crimes being committed, there is no investigation involved in the scenario—it is essentially a raid and a series of fights. Such that the player character Judges could be replaced by a Cleric, Fighter, a Thief, and a Wizard, and the criminals by Orcs and you would be hard pressed to tell the difference. Third, and worst of all, ‘State of the Empire’ does not provide for the player character Judges to do what they are meant to be doing and that is, ‘judge’. There are no guidelines in the quick-start for sentencing criminals, which really misses the point of what a Judge in the setting of Judge Dredd and Mega-City One does. The scenario focuses all too much on the execution duty of the Judges when it should have given equal focus to the conviction, sentencing, and execution of criminals. The doubly sad news is that ‘State of the Empire’ is the adventure from Judge Dredd & The Worlds of 2000 AD Roleplaying Game core rulebook. Doubly sad because gaming groups are likely to have played it by the time the core rulebook is released and because it is not a good adventure. A not unreasonable ‘dungeon bash’, but as a scenario for a roleplaying game based on the Judge Dredd comic strip, it fails to get across any of the flavour, feel, or tone of what a Judge Dredd story is. Now ‘State of the Empire’ is not without merit. Besides the primary set-up of Judges going into clean up a building after Judge Dredd himself has been in there, two other options are given. One is to play as citizens going into the ruins of the Empire State Building in search of a missing boy, the other is as Perps—criminals—going in after some loot. Hooks are provided to that end, but not pre-generated player characters. A group will have to wait for the Judge Dredd & The Worlds of 2000 AD Roleplaying Game core rulebook to be able to play either, which is a pity, because as a scenario for either, ‘State of the Empire’ works as a combat-focussed session’s worth of play. 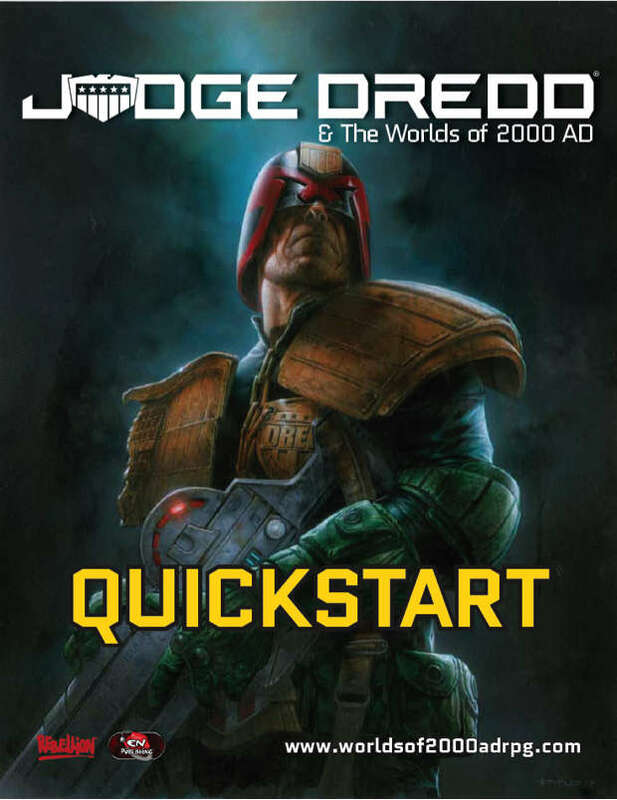 Physically, Judge Dredd & The Worlds of 2000 AD Quick-Start is a twenty-nine-page, 12 MB, full colour PDF. Its layout is tidy, it uses some illustrations from 2000 AD, and the maps clear enough. It does need another edit in places though. As a quick-start, Judge Dredd & The Worlds of 2000 AD Quick-Start comes with everything a gaming group needs to try the roleplaying game out. It does need more preparation than it should, that is, it the player character sheets need some extra information they lack, and the scenario at best, works as a showcase for the mechanics, if not the setting. In fact, it would be better if the Game Master was to go and track down any one of the scenarios published for any other Judge Dredd-based roleplaying game, adapt it to the rules for the Judge Dredd & The Worlds of 2000 AD Roleplaying Game, and run that rather than ‘State of the Empire’. Ultimately, the best thing about the Judge Dredd & The Worlds of 2000 AD Quick-Start is that it is free. It is just a pity that ‘State of the Empire’ is not because you will have pay for it when purchasing Judge Dredd & The Worlds of 2000 AD Roleplaying Game core rulebook.